If you happen to be in Birmingham, don’t miss the opportunity of seeing The Big Picture photo mosaic in Millenium Park, and even walking on it! Made up of 112,896 personal images submitted by people from across the West Midlands, the photo mosaic sets a new record by being the world’s largest photo mosaic. 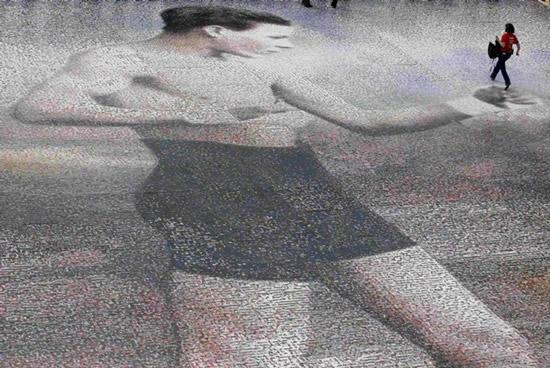 With a massive size of 30m x 30m square, the record-breaking work of art gathers photographs carefully selected to recreate the portrait of amateur boxer Arthur James Bunce taken during the 1920s. The project was launched to encourage people to get involved in arts. By donating each a picture of his/her daily life, thousands of people in West Midlands have contributed in this fascinating piece of mosaic and feel part of a big success story.